If you’ve followed a link to this page to read ‘North of Everywhere’, apologies. Deskbound Traveller had rights to publish the poem only until March 15, 2014. You can, however, still read it in Helen Mort’s Division Street. 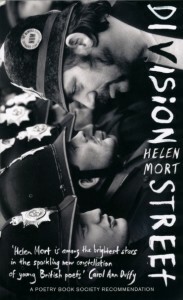 Extracted from Division Street by Helen Mort (Chatto & Windus). © Helen Mort 2013. Helen Mort was born in Sheffield in 1985 and grew up in nearby Chesterfield. She has won the Foyle Young Poets Award five times, received an Eric Gregory Award in 2007 and won the Manchester Young Writer Prize in 2008. In 2010, she was poet-in-residence at the Wordsworth Trust, Grasmere. She lives in Derbyshire and is currently (until Sept 2015) Derbyshire Poet Laureate.